Radiology On-Call covers the full spectrum of clinical scenarios that you are likely to see in the emergency department or during an in-house call. Two hundred cases are logically arranged by organ system, supported by 375 precise, state-of-the-art radiographs, CT, MRI, nuclear medicine and ultrasound images that accelerate on-the-spot clinical decision-making. 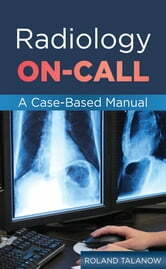 Radiology On-Call has an easy-to-navigate, streamlined style that features annotated images and minimal text. The author provides only those facts and brief descriptions that are needed to become familiar with each entity. Cross-reference to interactive online tutorial: Cases are linked to an online tutorial (www.oncallradiology.com) providing many cases in a unique interactive way almost as seen on a real workstation (scroll, window, level, magnify, pan).